This method is used for bulk article delivery. If you have bulk articles for the same recipient then you can select bulk invoicing. 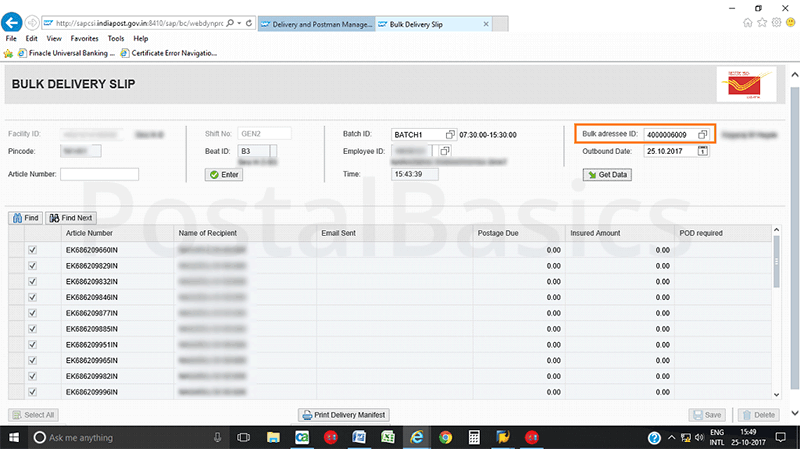 Here, you have to select the Bulk Addressee ID which is associated with the bulk recipient. The beat which is assigned for that will automatically get selected. Just invoice the articles same as you invoiced in Issue Postman. Select all and click on save. Now, take a print of the delivery slip. The return of the bulk articles are also same as in Postman Return. If all the articles are delivered, then just click on save button. If in case the articles are not delivered, select the Reason for nondelivery **, **Reason type, and click on Apply to all.